All bars involved today, and Golf team continues to impress, truly awesome! Ryan Garner and Brandi Martin. "Following the Crowd to Citizen Science" by Matt Ridley, The Wall Street Journal. "Crossroads of Ourselves", free CrossFit Journal article by Ryan Carbone. Kristan Clever 128 reps, Rebecca Voigt 107 reps, Katie Hogan 91 reps.
"Ones to Watch", free CrossFit Journal article by Hilary Achauer. "In the long run, a short cut seldom is." Some new items to make WOD's go smoother. Spencer Hendel: clean 352, bench 281, OHS 341 = 974lbs. "To be thrown upon one's own resources, is to be cast in the very lap of fortune." CrossFit Level 1 Certificate Courses: 3rd Infantry Division, Ft Stewart, GA, Alamo CrossFit , NorCal CrossFit, CrossFit Virtuosity, CrossFit Atlanta, Mundo CrossFit, CrossFit Brisbane, CrossFit Santiago. CrossFit Coach's Prep Course: University of San Diego, CA. "20 Common Grammar Mistakes That (Almost) Everyone Makes" by Jon Gingerich, Lit Reactor. Mike, Mike and Juan enjoying a day at BU CrossFit. Peter Egyed 4:45. Post time to comments. A demonstration of what happens when you don't do double unders efficiently. "Anatomy of a Tear-Jerker" by Michaeleen Doucleff, The Wall Street Journal. Brendan Clarke 17:44, Doug Armstrong 18:06. Post time to comments. Group 1 killing the push press at BU CrossFit. 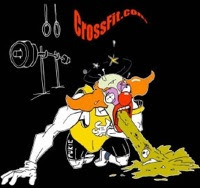 "Hitch Is Hooked", free CrossFit Journal article by Mike Warkentin. Congrats to Zarco who Completed the Level 1 practical certification. CrossFit Level 1 Certificate Courses: 3rd Infantry Division, Ft Stewart, GA, CrossFit Refinery, Atlas CrossFit, CrossFit Verve, CrossFit SS, CrossFit Max Effort, CrossFit Basel. CrossFit Kids Course: CrossFit New England. "Truth is the secret of eloquence and virtue, the basis of moral authority; it is the highest summit of art and of life." Laurie Galassi 2:53 (155lbs), Annie Sakamoto 3:31 (155lbs), Candice Ruiz 3:57 (185lbs). A great day of cleans. "The Little CrossFitter That Could", free CrossFit Journal article by Julie Kelly. Lucas Zepeda 24:39, Russ Greene 25:44. Post time to comments. CrossFit Competitors Course, CrossFit Park City. Golf Team rocks at BU CrossFit! Ask them what they did different during their WOD. "Marne Division embraces CrossFit" by Sgt. Robert Schaffner Jr.
"Lessons Learned", free CrossFit Journal article by Pat Sherwood. Will the groundhog see his shadow? let us know on BU Crossfit facebook page. Dave Lipson, 485lbs, Jason Khalipa 365lbs, Pat Barber 315lbs. "Like us" on BU CrossFit page in Facebook and share who this person is. "What Would The Iron Lady Do?" by Charles Moore, The Wall Street Journal.